Home » Bollywood News » Thugs Of Hindostan Vs 2.0 Vs Zero: Which Trailer Has The Cleanest VFX? VOTE NOW! 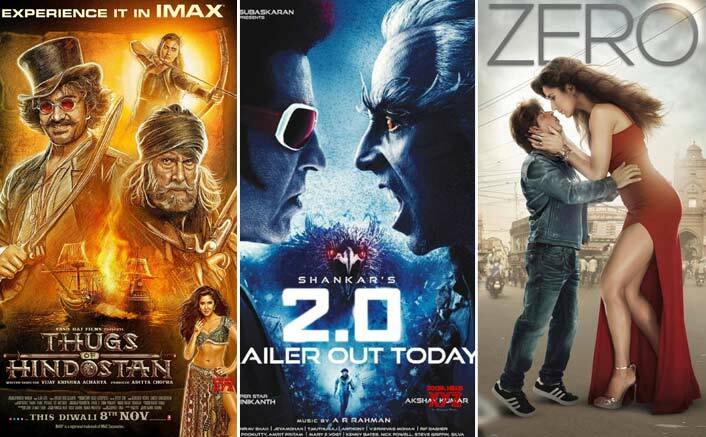 Right from Aamir Khan’s Thugs Of Hindostan, Rajnikanth-Akshay Kumar starrer 2.0 to Shah Rukh Khan’s Zero, the three biggies will be battling out at the box office to prove their potential. In the last two months of the year, the box office to witness fireworks as the much-awaited movies of the year are geared up for a grand release. Right from Aamir Khan’s Thugs Of Hindostan, Rajnikanth-Akshay Kumar starrer 2.0 to Shah Rukh Khan’s Zero, the three biggies will be battling out at the box office to prove their potential. Thugs Of Hindostan is YRF’s most expensive project till date. It features Superstar Amitabh Bachchan, Aamir Khan, Katrina Kaif, Fatima Sana Shaikh and British actor Lloyd Owen in lead roles. The movie traces back to the era of East India Company in India and depicts the fictional story of the struggle between Indian thugs and British invaders and is set on a backdrop of the sea. As most of the significant scenes are shot on ships, the movie relies heavily on the use of VFX. As the trailer and makers suggest, the movie is expected to be visually stunning. Talking about 2.0, it marks the first collaboration of Khiladi Akshay Kumar and Superstar Rajnikanth. Being a Sci-fi adventure movie, 2.0 boasts of the high quality of visual effects, at which the trailer already hinted. It’s the most expensive movie in Indian cinema with a budget of 600 crores. Earlier, Akshay stated that more than 3000 technicians have put their efforts in the making. Additionally, it is the first Indian movie to be entirely shot on the real IMAX 3D camera. Also, 2.0 faced several delays due to post-production work on VFX. As the trailer has liked by many movie buffs, the efforts seem to be paid off. In the much awaited Zero, Shah Rukh Khan is portraying vertically challenged man for the first time. There was curiosity amongst the movie maniacs about the standard of visual effects, as the actor is shown dwarf in the movie. On Khan’s birthday, when the much-awaited trailer released, the viewers were awestruck by the look of the actor. The trailer received a phenomenal response, with most of the praises for its superlative VFX work. Although the above mentioned three biggies belong to different genres, there always remains an area for comparison as VFX plays a significant role in all of them.